Recently Cats Protection’s behaviour expert Nicky Trevorrow took over our Facebook page and answered live feline behaviour questions from our supporters. Did you miss it? Not to worry – check the end of this post for dates of further upcoming Facebook Q&As. Question: My 16-year-old cat went blind about a year ago and since then she poos outside of the litter tray. What can I do to help her use the tray? Answer: Sorry to hear that your cat has gone blind and is now toileting outside the litter tray. The first thing to do is to take your cat to the vet for a health check, especially to check her joints to see if she's stiff and to rule out other medical problems that could cause this behaviour. Once your vet has ruled out medical reasons, try providing your cat with a litter tray with one of the sides cut out. Ensure you sand off the edge of the tray so there are no sharp edges. Even if the vet finds that she isn't stiff, it may help her to get in and out of the tray more easily. For more advice, a qualified behaviourist could help with a variety of ways to improve the environment for your cat. You may also find our leaflets about elderly cats and cats with disabilities helpful. 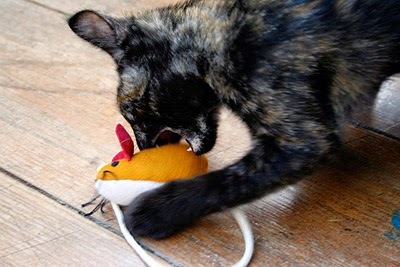 Question: When my cat carries her toy mouse around the house, why does she shout? We had another cat that also did this, but she didn't want to be seen and if she caught us watching her she immediately dropped the mouse. Why would she do this? Answer: Often cats show this behaviour which is similar to when they are carrying prey. Many cats do a particular 'I've caught something' miaow! Question: Is there a way to discourage nipping of toes when a cat gets excited? We recently homed a tabby from the Cats Protection Haslemere Adoption Centre and he has a habit of nipping feet when he gets excited! Answer: I'd recommend wearing thick indoor slipper boots to keep yourself protected and stop you reacting (any noise could encourage the cat more) and then use a fishing rod toy to redirect the cat's excited behaviour towards something suitable. Ensure that fishing rod toys are stored out of his reach when not in use. Question: Why does my well-fed cat kill and eat mice? Answer: Many owners wonder the same thing! It's because the cat is still hardwired with natural instincts of their wild ancestors and because the cat's hunting drive is separate to their hunger drive. This is why they still feel the need to hunt even if they are not hungry and the whole process gives them an endorphin (happy hormone) rush. Question: My cats are struggling to let me sleep. They wake me up several times a night by licking my face nudging me or even laying on my head. How can I stop them? Answer: Unfortunately this is only going to get worse as the daylight hours increase! 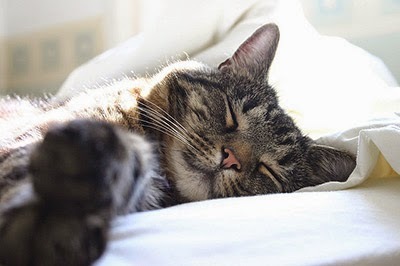 Cats are crepuscular which means that they are most active during dawn and dusk (when prey is also most active) so cats naturally feel wide awake and ready to start the day in the early hours. Try giving your cat several small meals throughout the day in feeding enrichment toys such as a toilet roll pyramid (instructions in this feeding enrichment blog post). Do also check out our boredom busters video playlist below for lots of creative ways to keep cats entertained! Question: How can I get my eight-year-old female and nine-month-old male (a new addition to the house) to get on better? Twice a day they tear around the house hissing and bopping each other. They never get close to one another. Answer: Sorry to hear that your cats are not getting along. It may be that you need to take it back to the beginning and try a gradual integration programme. Check out our leaflet - Cats living together for some advice. If you are still having problems then get a referral to a qualified behaviourist to assess your cats' relationship. Please note that we are unable to give specific advice on your cat's health or any change in behaviour observed. For medical problems consult your vet who will have access to your cat’s medical history and will be able to examine them. You’ll find more information about cat care and behaviour in our selection of Essential Guide leaflets and do check out our free online e-learning course too which explains the ancestry of cats. Fancy asking one of our feline experts a cat care question? Don’t miss the next live Facebook Q&As: Our Field Vet Officer Vanessa Howie will answer your veterinary questions on 12 March; and Behaviour Manager Nicky Trevorrow will be back answering questions on feline behaviour on 9 April. Each Q&A takes place on our Facebook page at 2pm for one hour. This is all really great advice! Cats do such funny things sometimes. I think that it is really important that you always keep your veterinarian informed about any strange behaviors your cat might have. Definitely, Robin, if you notice any change in your cat's behaviour the first thing you should do is consult your vet!